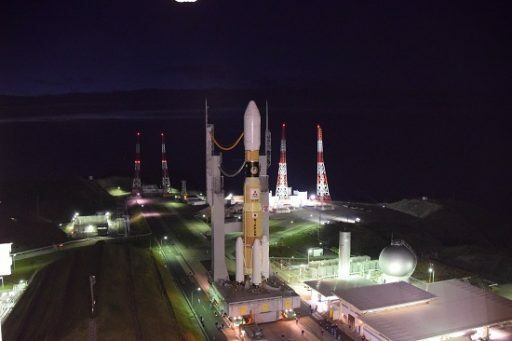 H-IIB departed its picturesque launch site on the southern tip of Tanegashima Island at 13:26 UTC on Friday, putting on a show as it blazed into the night sky over the Pacific with an audible scream and a total thrust of 1,200 metric-ton-force – making for a very quick initial climb-out. 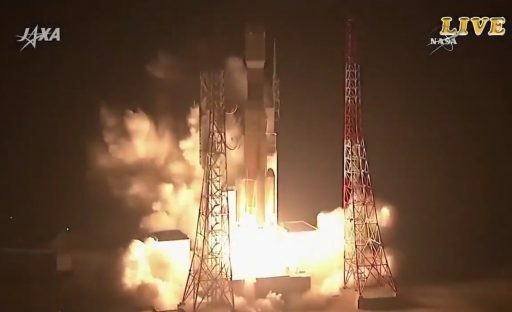 Conducting its sixth flight, H-IIB was in action for 15 minutes, sending HTV-6 into the planned orbit en-route to an arrival at the Space Station on Tuesday. HTV is an important member of the Station’s cargo vehicle fleet, not only because it is the biggest but in large part due to its ability to carry sizeable external payloads to the Space Station via its Unpressurized Logistics Carrier which, on this mission, is loaded with an external payload mass of 1.9 metric tons. Mounted on the Exposed Pallet of the vehicle are six new Li-Ion batteries that will replace a dozen of the Station’s 48 existing Nickel-Hydrogen batteries that are at the end of their regular operational lives. The replacement will be completed in an extensive robotic and spacewalk effort that will unfold aboard ISS beginning later this month and stretching into mid-January. A total of four HTV missions are needed to send the full complement of replacement batteries to ISS and take advantage of the spacecraft to dispose of the majority of old battery units. 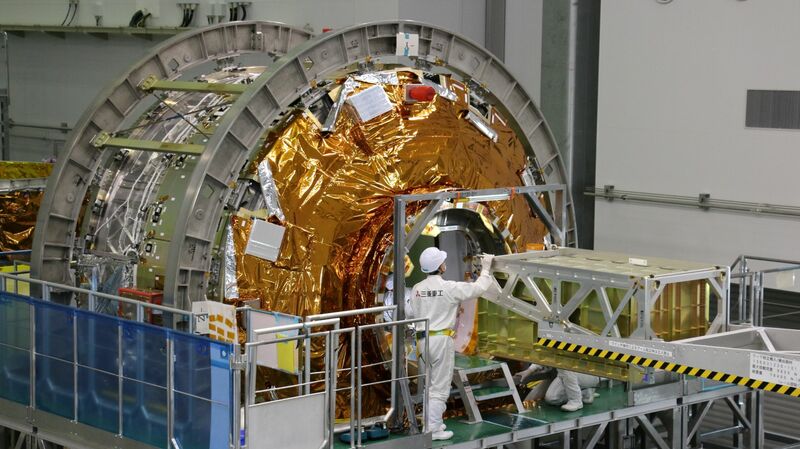 Loaded into the Pressurized Logistics Carrier of HTV-6 are 3,900 Kilograms of cargo delivered via up to 248 Cargo Transfer Bags stowed in HTV Resupply Racks, further expanding HTV’s capability over 242 CTBs on HTV-5. The internal cargo comprises 1,264 Kilograms of crew supplies (food rations, 600 liters of water, clothing, hygiene equipment & consumables), 663kg of maintenance hardware, 420kg of utilization payloads, 156kg of computer resources, 35kg of spacewalk equipment, and 28kg of Russian cargo. Scientific facilities hitching a ride on HTV-6 include a Two-Phase Flow Experiment that explores the mechanisms of gas-liquid phase change to help inform the design of future spacecraft thermal regulation systems. A new position and energy-sensitive radiation sensor to be deployed in the Kibo module will be evaluated as a precise real-time monitor for radiation dose encountered by crews. HTV-6 is also carrying hardware to be transferred to the outside of ISS, notably a package of HD and 4K cameras that will take up residence on the Exposed Facility of Kibo, an ExHAM external experiment platform that will expose different experiments to space, and a new CubeSat deployer with twice the capacity of JAXA’s previous deployment mechanism for the release of small satellites from ISS. The cargo manifest for the HTV-6 mission remained unchanged after last week’s Progress MS-04 launch failure as no critical hardware items were on the Progress vehicle and HTV was already deep in its late cargo loading flow that comprised loading up to 92 cargo bags with the last cargo items placed into the vehicle until 80 hours from liftoff. 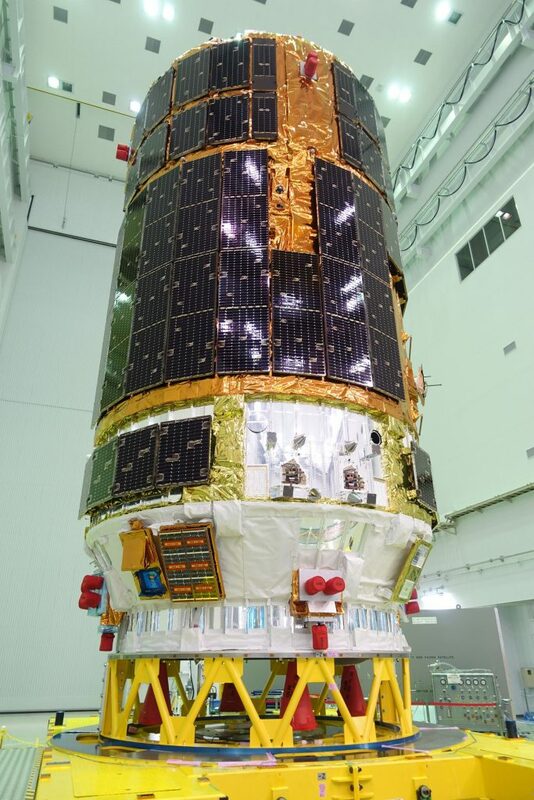 HTV-6, continuing to fly under the Japanese name of Kounotori-6 (meaning ‘White Stork’), weighs in at 16.5 metric tons and comprises four major sections – the Pressurized Logistics Carrier that can be accessed by the crew in orbit, the Unpressurized Logistics Carrier with its removable Exposed Pallet hosting the external cargo, an Avionics Compartment and a Propulsion Module. The job of lifting HTV-6 into orbit fell to the H-IIB that is Japan’s most-capable rocket developed to date, debuting in 2009 on the first HTV mission and so far only flown with HTV as a payload. Japan’s H-II fleet of rockets, with the H-IIA workhorse and H-IIB heavy-lifter, employ a large number of common systems – the distinguishing property being the two-engine, five-meter diameter first stage used on H-IIB that gives it the performance edge over H-IIA with its single-engine, four-meter core. 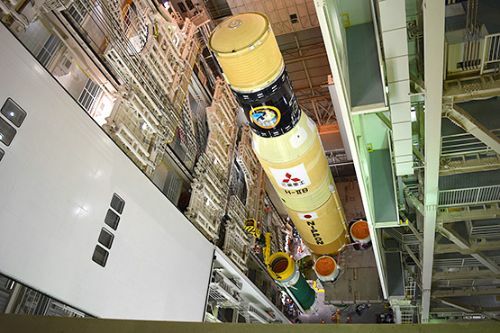 Comprised of a two-stage stack and four strap-on Solid Rocket Boosters, H-IIB entered its countdown to launch at 21 UTC on Thursday when it emerged from its assembly building for a half-hour trip to Pad 2 at the Tanegashima Space Center. After the 57-meter tall rocket arrived at the pad, technicians connected it to ground support systems before departing the 400-meter clearance zone for power-up of the rocket and a multi-hour checkout sequence. The safety zone was extended to 3,000 meters for the start of tanking eight and a half hours before liftoff to fill the two rocket stages with a total of 194,400 Kilograms of Liquid Oxygen and Liquid Hydrogen – an operation taking three hours. H-IIB entered stable replenish five hours and 49 minutes before liftoff, sitting quietly atop its launch pad as night fell over Tanegashima Island. The 531-metric ton rocket sat calmly on its sea-side pad as teams repeated a series of checks before configuring the vehicle for the start of its automated countdown which was preceded by status checks and a final weather verification. HTV-6 switched to battery power and was verified ready for flight well before the X-4 minute and 30-second milestone of transitioning the countdown to computer-controlled mode. The rocket transitioned from ground facility power to onboard power and pressurized its cryogenic tanks for liftoff followed by the arming of the flight termination system and the activation of the pad’s water deluge system at X-1 minute. Thermal batteries on the four boosters were powered up and the SRBs went through a final thrust vector control check before control was handed to the H-IIB for the ignition sequence. The hydrogen-fueled LE-7A engines on the core stage ignited at X-5 seconds, each soaring to a thrust of 86 metric ton-force in a carefully-designed fuel-rich ignition sequence under close surveillance by the onboard computers. 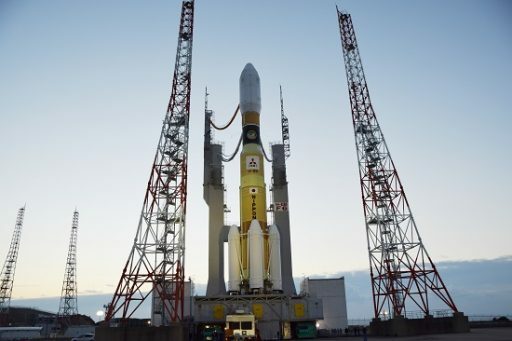 H-IIB was catapulted off its launch pad at 13:26:47 UTC when the four boosters fired up to give the rocket a total thrust of 1,200 metric ton force. The kick delivered by the four boosters – generating 81% of the vehicle’s total liftoff thrust – created a very fast climb-out with H-IIB balancing in a vertical posture for less than ten seconds before pitching and rolling onto its south-easterly departure path. 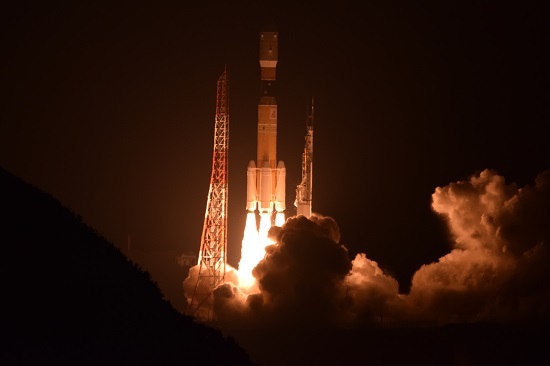 The familiar scream of the H-IIB was heard as the rocket lit up the night skies on its departure of Tanegashima Island, burning through 2,800 Kilograms of propellant each second of powered flight. 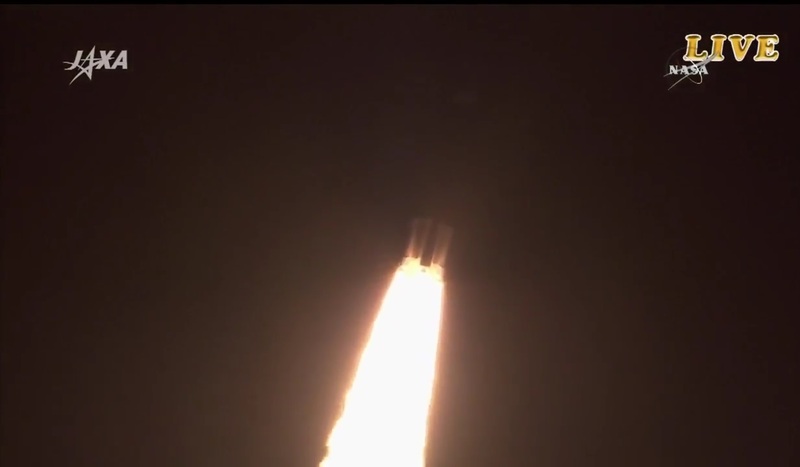 H-IIB pushed through the sound barrier less than a minute after liftoff and experienced Maximum Dynamic Pressure 70 seconds after launch, holding its precisely planned course for its high-speed orbital delivery. The four boosters – each generating 235 metric tons of thrust – helped accelerate the rocket to a speed of nearly two Kilometers per second, each burning 66,000 Kilograms of propellants in one minute and 54 seconds. Burnout of the boosters was sensed by the declining pressures within their chamber, triggering the flight computer to initiate the separation sequence. The 15-meter long boosters separated in pairs at T+2:04 and T+2:07 with cutting charges firing to rotate the SRBs outward on their thrust struts to ensure a clean separation at an altitude of 65 Kilometers. 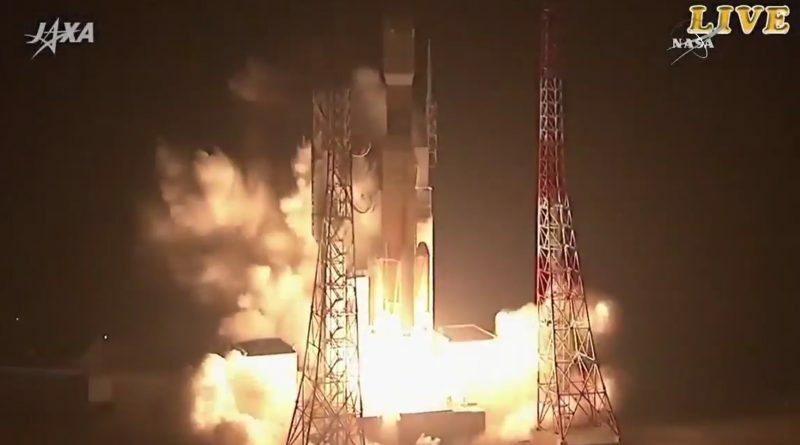 H-IIB continued toward orbit powered by the two LE-7A engines alone, guzzling down 520 Kilograms of cryogenics per second to generate a vacuum thrust of 220,000 Kilogram-force. Passing through 120 Kilometers in altitude, H-IIB split open its 15-meter long payload fairing halves which then rotated outward and dropped away – revealing the HTV-6 spacecraft at T+3 minutes and 40 seconds. 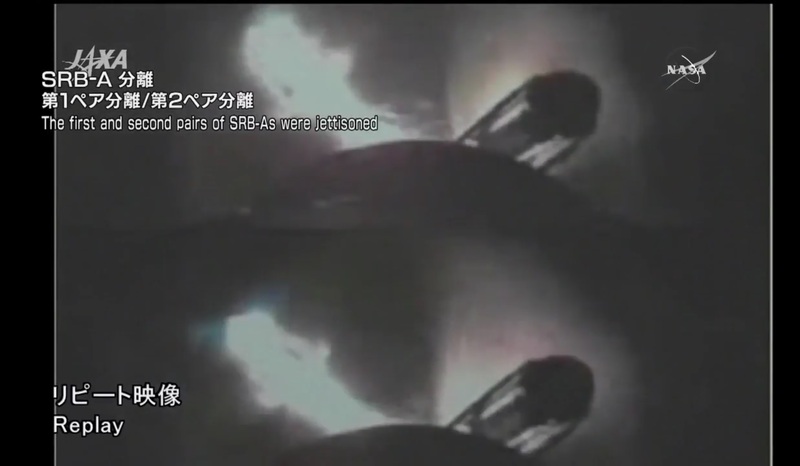 After a clean fairing jettison, the first stage continued a smooth flight, boosting the vehicle to a speed of 5.6 Kilometers per second before handing off to H-IIB’s second stage nearly 200 Kilometers in altitude. Main Engine Cutoff was marked five minutes and 47 seconds into the flight followed seven seconds later by the separation of the 38-meter long core stage via pyrotechnic charges and loaded springs. Right at the T+6-minute mark, H-IIB fired up its lone upper stage engine, soaring to a thrust of 14,000 Kilogram-force for a burn of eight minutes and 19 seconds. Relying on its LE-5B engine, H-IIB continued on a south-easterly flight path over the Pacific, homing in on a target orbit of 200 by 300 Kilometers, inclined 51.6 degrees. Cutoff on the second stage occurred 14 and a half minutes into the flight when H-IIB reached an altitude of 290 Kilometers, traveling 7.6 Kilometers per second. 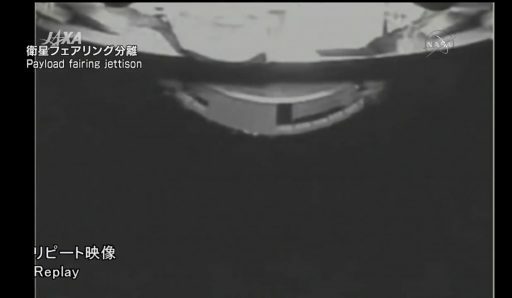 Kounotori-6 separated from its booster 15 minutes after liftoff, being sent off on its four-day flight to the International Space Station to make an out-of-this-world cargo delivery. 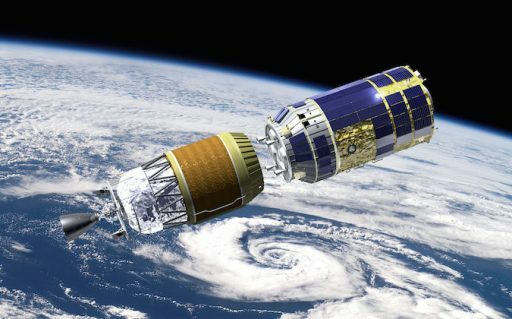 The first tasks for HTV after arriving in orbit were to establish a stable three-axis orientation and start communicating with Mission Control through the Tracking and Data Relay Satellite System for detailed checkouts completed in the first hours of flight. 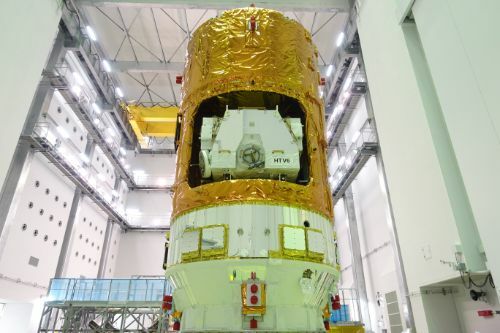 HTV-6 is set for a pair of orbital maneuvers later on Friday to begin the climb toward the Space Station that is currently flying in a 401 by 410-Kilometer orbit. Rendezvous will start on Tuesday to move HTV-6 into the close vicinity of ISS for a straight-up approach from below the complex to set up for a robotic capture of the spacecraft around 11 UTC. The second stage of the H-IIB rocket was tasked with a deorbit maneuver 99 minutes into its flight – a 59-second retrograde ‘idle-mode’ maneuver, running pressurized propellants through the LE-5B but not actually igniting the engine to generate sufficient thrust to drop the stage out of orbit for destructive re-entry over the Pacific Ocean.